VIRGIN RIVER GORGE, Ariz. — Traffic on Interstate 15 was backed up for on several miles in the Virgin River Gorge after a semitractor-trailer crashed early Thursday morning, blocking both northbound lanes of traffic for nearly three hours as crews worked to clear the wreckage. 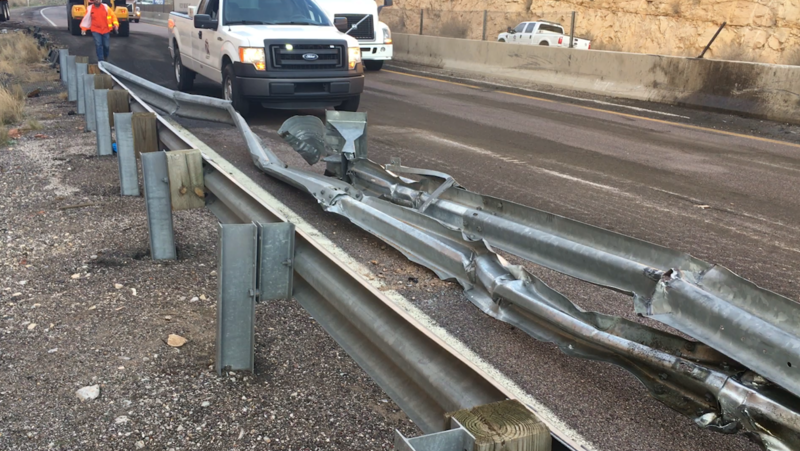 Shortly before 5 a.m. officers and emergency personnel responded to a crash on I-15 northbound involving a semitractor-trailer that was severely damaged and blocking both lanes of traffic, Arizona Highway Patrol Sgt. John Bottoms said. Once officers arrived they found the cab of the semi in the left lane of the interstate, with the trailer still attached and angled across the right lane. The driver had “very minor lacerations to his cheek,” Bottoms said. Traffic came to a standstill and backed up immediately while emergency crews responded and began clearing debris from the roadway. The driver told officers that as he was heading north through the Gorge, he reached for a bottled water and lost control of the semi. It veered to the right and struck a guardrail. The semi continued along the guardrail until it nearly went off the right shoulder, but the driver turned the wheel to the left in an attempt to return to the lane of travel. Instead he overcorrected, Bottoms said, which sent the truck careening to the left into the guardrail on the opposite side of the interstate with enough force to rip the front axle off of the truck. The semi finally came to rest sitting diagonally across both northbound lanes of traffic, with several feet of guardrail on both sides of the interstate completely destroyed. The axle was later found in the middle of Bridge No. 7, and officers dragged it off to the side and out of the way shortly after they arrived, Bottoms said. The trailer sustained moderate damage to the rear door during the crash; however, the cargo of nearly 10,000 pounds of sneakers remained contained and intact. 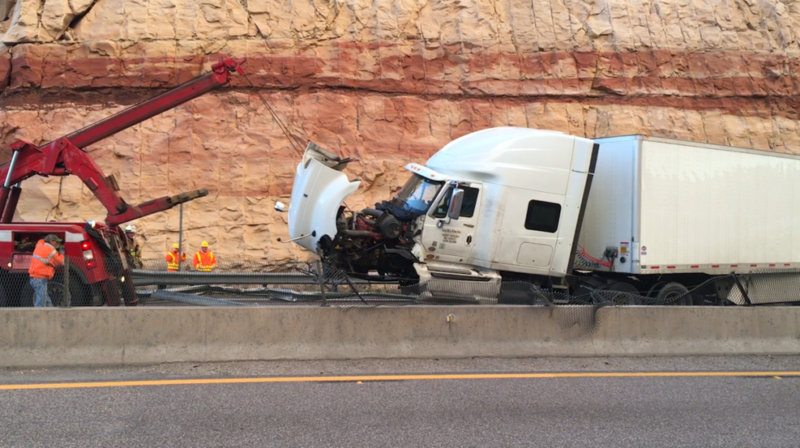 Several wreckers were called in to remove the semi from the roadway while crews from the Arizona Department of Transportation assisted emergency personnel with clearing all of the debris from the roadway, an operation that took more than three hours to complete, Bottoms said. Shortly after 8 a.m. both lanes of traffic were reopened, and traffic began to move slowly through the area. 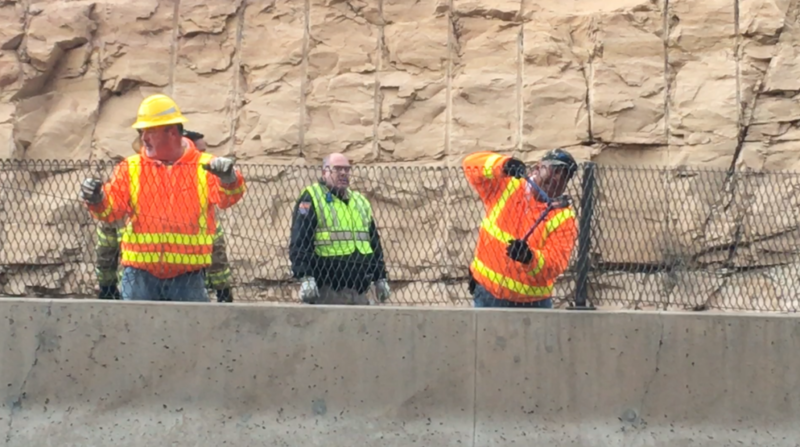 Arizona Department of Transportation crews remained on scene to cut and remove the damage guard rail and continued to remove any remaining debris left along the roadway. Bottoms said the driver was issued a citation for failing to control the speed of the vehicle to avoid a collision; however, the investigation into the crash is still ongoing. It is unknown whether any additional citations will be issued at this time, he said. Arizona Trooper John Rogers is in charge of the investigation into the crash, Bottoms said, and was interviewing the driver as the scene cleared. Arizona Department of Public Safety Highway Patrol Division, Beaver Dam/Littlefield Fire District, the Beaver Dam/Littlefield Ambulance, St. George Fire Department and the Arizona Department of Transportation responded and assisted with the scene. 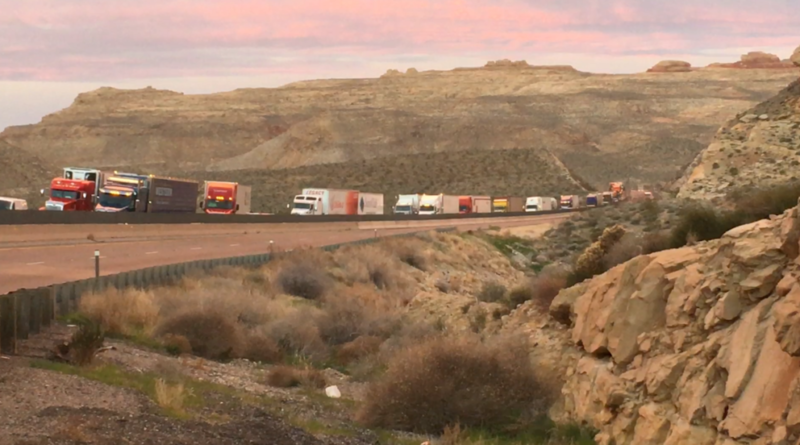 St. George News Videographer Mike Cole contributed to this report. We were coming through the Gorge last evening just before dark and a Semi to the right of us was weaving into our lane, and when your in the left lane with the guard rail next to you and no place to go? Your screwed…Truckers, how about waiting on the water or cell phone, or candy bar or whatever the hell else until you clear the gorge and maybe save lives, maybe even your own, no damn excuse…..but this happens every damn day and almost never see a UHP or AHP patrol unit anymore in the Virgin River Gorge, why, not enough tickets to write? funny how last week or so you reported on a semi wreck on old 91 the tow company’s name was thrown around like advertizing. Now not a mention or a photo of BRACKENS TOWING the oldest,best equipped,tow company around the area.